Phase One of training has to do with having trainees confront their own understandings of the nature of conflict and how they deal with it. A trainer may provide some exercises for the trainees - ‘thought experiments’ - regarding some conflict scenarios and garner the trainee’s response to this. Commonly, for example, a trainer might ask the trainees how they would deal with a much stronger opponent, with tattoos and scars and who looks ‘hard’, in order to provoke a discussion about the nature of intimidation. This phase encourages the visualisation of conflict scenarios and the development of mental models, decision-making strategies and personal internal commitments to the issue of conflict. In our experience at Dynamis, a discussion of the law in regard to reasonable force and the case-law from that field offers an excellent vehicle for this phase of training as it has much to do with how emotional-cognitive decisions are made. Phase Two of training has to do with skill development, at an intensity which gradually builds competence with the skills required to persevere and successfully manage the confrontation. Trainees are provided with relevant and effective skills which are comparitively easy to acquire given the amount of time they can devote to the training. We have written at length about the issues with much self-defence and breakaway training and the over-complexity, under-relevance of it here on this blog previously. During this phase the trainees have the opportunity to rehearse the coping/confronting skills, re-imagining the process of the confrontation from one with a negative outcome to one with a positive outcome - reversing the ‘prey’ role which can crystallise in high-stress moments. Trainees re-structure they way in which they approach the confrontation, using their internal dialogue and their internal associations differently now. Trainees develop, with time and opportunity, new problem-solving abilities which give them more options and alternatives during a confrontation - they begin, in short, to think more tactically about situations, because their level of stress-arousal is reducing as the problem becomes clearer and more familiar. Phase Three of training provides the trainees with the opportunity to now apply their new skills in (again, gradually) increasing levels of intensity, although at this time the trainer should be focussing on bringing not just intensity but reality into the training. The focus here is on providing a variety of opportunities for the trainee to experience the entirety of the preparation which has gone before. 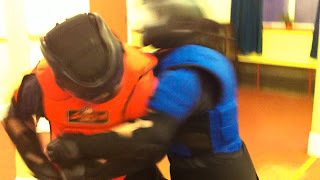 For example, in our training at Dynamis, the trainee will be placed in situations where they must now make decisions and take action based on their own beliefs and in accordance with Use of Force law, personal Duty of Care or Task Role, Risk Assessment, their ability to verbally manage the confrontation and then finaly their physical capacity to protect themselves or another. Running these scenarios can take from 15 seconds to 90 seconds to complete, depending on the amount of pre-assault verbal dialogue and the motivation/aggression level of the role-players. The use of training armour can significantly effect the fidelity of this Phase Three training. At Dynamis, we use Hoplite Training Armour. In our next article we will discuss how the Hoplite Armour assists us to provide Stress Inoculation and Stress Exposure to our trainees.